After more than a week of grueling tournament action, the 2014 World Series of Poker main event is down to the final table, otherwise known as the November Nine. They will return to the Rio All-Suite Hotel and Casino on Nov. 10 to battle it out for the bracelet, as well as the $10 million first-place prize. The field of 6,683 attracted players from 87 different countries, so it’s no surprise that the final table will be an international affair, with six nations represented by players from the United States, Brazil, Sweden, Norway, Spain and the Netherlands. Here’s a look at the November Nine. William Pappaconstantinou, otherwise known as Billy Pappas, is a 29-year-old world foosball champion from Lowell, Massachusetts. Pappas has very limited poker tournament experience, with just $81,000 in earnings since 2012. His best finish was a fifth-place showing at a WSOP Circuit stop at Palm Beach Kennel Club last year for $52,372. Felix Stephensen is a 23-year-old from Oslo, Norway, who is playing in his second WSOP main event. His experience is even more limited than Pappas, with just one tournament cash on his poker resume, a 92nd-place finish in the 2013 EPT Barcelona main event for $16,791. He is guaranteed to easily eclipse any prior score in this event, with at least $730,725 dollars locked up. Going into the final table as the chip leader is 31-year-old poker pro Jorryt van Hoof, from Eindhoven in the Netherlands. He is the second Dutch player to make the final table in the last two years, joining 2013 seventh-place finisher Michiel Brummelhuis. van Hoof has $188,000 in tournament earnings, with final table appearances at the Master Classics of Poker and on the European Poker Tour. All eyes will be on 29-year-old Chapel Hill, North Carolina’s Mark Newhouse, who became the first player since Dan Harrington to make back-to-back main event final tables. Newhouse, who has $2.7 million in career tournament earnings, the majority of which came when he won the 2006 WPT Borgata Open for $1.5 million. In 2013, he finished ninth in the WSOP main event for $733,224. The youngest player at the final table is 22-year-old Andoni Larrabe from Basque, Spain. Larrabe is the first Spaniard to make the final table since Carlos Mortensen won the main event in 2001. He has $98,000 in tournament earnings, with the majority coming from an 11th-place finish at the 2012 EPT Grand Final main event. William Tonking is a 27-year-old online poker player from Flemington, New Jersey. He has $92,000 in tournament earnings with 10 career cashes. His best result came in the 2012 Sands Deepstack Extravaganza main event, where he took fifth place for $28,000. He also cashed in a WSOP event earlier this summer, earning nearly $4,000 for a 77th-place finish in the $1,500 no-limit hold’em mixed max tournament. Daniel Sindelar is a 30-year-old professional poker player from Columbus, Nebraska who now resides in Las Vegas. He has $527,000 in career tournament earnings including a $105,312 win in the 2007 Fall Poker Classic main event and a $60,000 win in a Card Player Poker Tour event at the Wynn in 2013. The player coming in with the most live tournament experience is Stockholm, Sweden’s Martin Jacobson. The 27-year-old poker pro, who now lives in London, finished sixth in the 2013 WSOP One Drop Hill Roller for $807,427. He also has two runner-up finishes on the European Poker Tour, earning $762,185 at EPT Deauville and $382,156 at EPT Vilamoura. He has over $4.6 million in career tournament earnings. 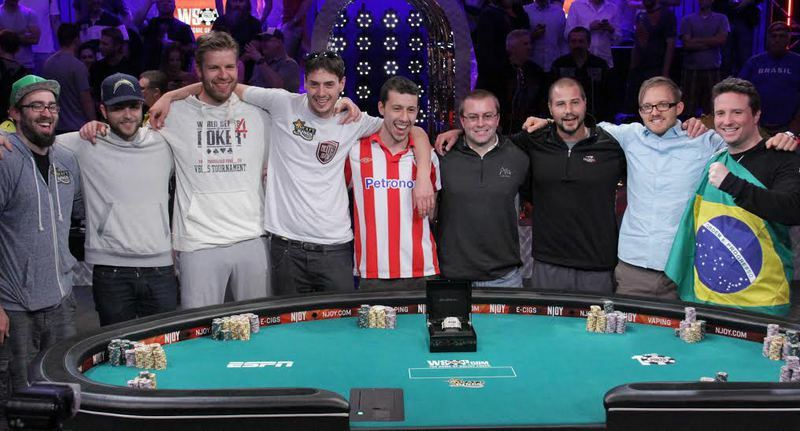 Bruno Politano is the first ever Brazilian to make the WSOP main event final table. The 31-year-old from Fortaleza works as an administrator and only plays poker as a hobby, but does have some previous tournament experience. His best finish was an eighth-place result at the LAPT Brazil main event for $27,206. Each of the final nine players is now guaranteed at least $730,725. The average stack is 22,276,667, and with the blinds at 200,000-400,000 with a 50,000 ante, they’ll be working with an average of nearly 56 big blinds. ESPN will be broadcasting the WSOP starting Sunday, Sep. 28. There will be two-hours of coverage each Sunday leading up to the main event final table broadcast on Nov. 10 and 11.